Have you recently paid a contractor for a new deck? Maybe you’re thinking about installing a deck or will be purchasing a new home with a deck already installed. If so, I’d guess you’re with the majority of American homeowners. Since everyone and their mother already has a deck installed, how hard can it be right? It’s no surprise that deck safety is often taken for granted. 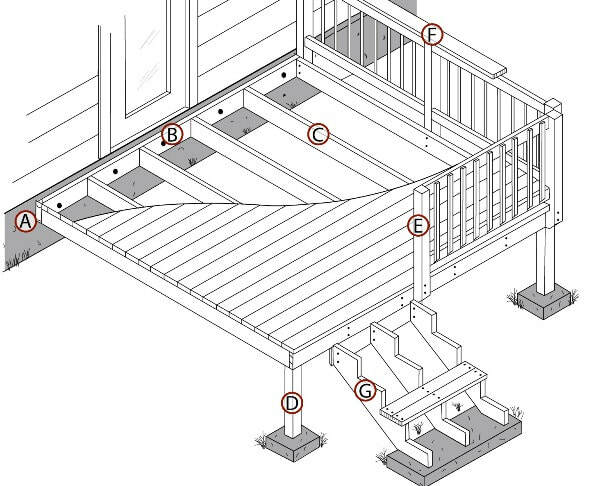 According to the Consumer Product Safety Commission, more than 6,000 people are injured every year in structural failures of decks or porches. And, according to the Experts at Robson Forensic , ledger board failures account for the highest number of deck collapses. We want to make sure your friends and family are safe so we’ve put together some information on ledger boards and their potentials failures so you can avoid them. First, you may be wondering what a ledger board is. If your deck is attached to your house, then the deck contains a ledger board. The ledger board is the horizontal board attached to the house that supports the end of the joists. The ledger board is typically bolted to the house framing, more specifically the house rim or band board. Okay, so now that we know what ledger boards are, how are they properly attached? ​There are three primary methods to attaching a ledger board to your house with the first being lag bolts. Lag bolts are widely used in older decks, though they are not typically used for ledger-to-house connections anymore. Despite their obsolescence through newer technology, some jurisdictions will still allow ledger boards to be attached with lag bolts. Don’t be afraid to question your contractor on your local building codes! The second method of attachment uses through bolts. Through bolting consists of a bolt, washer, and nut, and is still approved for ledger connections. As the name implies, the bolt is installed through the ledger board and house band boards, and then secured with a washer and nut. The final method has become very popular over recent years: structural fasteners. Structural fasteners are bolts that have been engineered specifically for attaching a ledger board to a house. There are many brands available but our preference, and perhaps the most popular, is the LedgerLOK by FastenMaster. What’s great about these fasteners is that they require a smaller diameter than lag or through bolts and do not need pre-drilled holes since the points are self-drilling. Most designs have thread patterns that “lock” the fastener into the wood to prevent the fastener from backing out over time. Insert transitional sentence. ​Okay, So how do the failures occur? Failures can occur for a few different reasons. In many deck collapse incidents, it’s been found that only nails were used to fasten the ledger. Because nails do not have any threads to resist loosening, they will pull out over time. When the nails loosen, the ledger will also loosen, sacrificing the structural integrity of the entire deck. Approved fasteners can also cause failures if they are not installed properly. For instance, if too few of the correct fasteners are installed, the deck may weaken over time and create the potential for a total failure. The number and spacing of ledger board fasteners is determined by the size and span length of the joists. Some manufacturers of structural fasteners will include a matrix table to determine the proper number of fasteners to use. The pattern of the installed fasteners is also important. Patterns are manufacturer specific but the most widely used, and code approved, is the “W” pattern. Finally, fastener placement relative to the edge of the ledger board, is controlled by code. Fasteners placed too close to the edge of the ledger boards can result in weakened connections.